« Download a calendar. Make a difference. Stamps are from Verve and you can find ’em here. Card was made with scraps from the basket on top of my work table. Super easy, super fast! Find the sketch at Beate’s blog here, then check out Cami, Charmaine, Laurie, Lori, Mary Jo, and Sharon. This entry was posted in copics, Stamped Stuff. Bookmark the permalink. Trackbacks are closed, but you can post a comment. Amen, sistah — I can definitely vouch for the coffee (she said while sipping, LOL)!! Very elegant card — love the colors/papers! Very pretty card! I love the saying. Love this – and I’ll drink a cup with you anytime. 🙂 Hugs! Girl…you do quick good! Love the texture, colors, paper….and for me it’s the diet coke. But caffeine, is caffeine! This is super cute! I love making cards from scraps! Makes me feel like I’m doing something good, using my supplies to the last square inch! LOL…love your card! What fun scraps from your table! Very cute card Jenn! Ooohh, I LOVE this sketch with that stamp set! Gorgeous card, Jenn! Have a wonderful weekend! What a fresh, elegant look for your fun sentiment! Your quick and easy looks fabulous. Doesn’t it feel so satisfying to grab scraps and make a card? Of course, mine never turn out this cute! Love it, Jenn! This is adorable. I love the color combination. Love this quick and easy card! 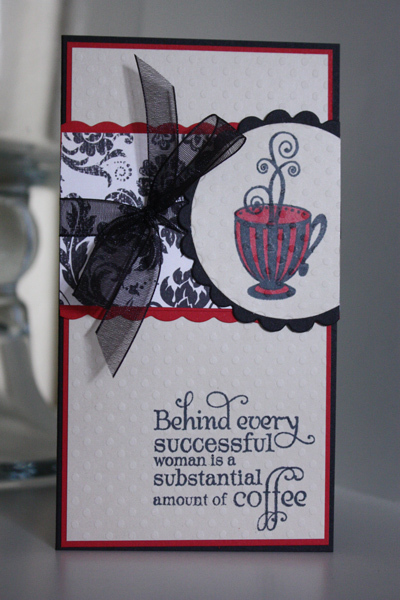 Perfect for someone like me….a total caffeine addict! LOL!